Finding an enclosure for the RF-IV sensor turned out to be a real challenge. As I mentioned before, because of the size and connector locations of the RF-IV PCB, there are not that many off-the-shelf boxes that were a good fit. I wanted a box that will allow me to install the sensor directly on the VNA's BNC ports (2" apart) and with enough height to install the corresponding bulkhead connectors. I was almost ready to go the CNC machine route and fabricate the enclosure out of a solid block of aluminum. I wanted the sensor enclosure to be compact since it is supported only on the two BNC connectors. After some more searching though, the Bud Industries CN-5701 box (Digikey p/n 377-1512-ND) seemed to be a possible candidate. I still had to use a vertical mill machine to remove the little PCB slots on the inside of the aluminum box and make the walls nice and smooth. This picture shows the box with a bushing for the control cable and the 3 bulkhead female SMA connectors. These connectors require a D-hole to prevent unwanted rotation. Initially, I was going to install male BNC connectors but decided in favour of the SMAs. They require less mounting hardware and I can always use adapters to BNC or N type connectors. In addition, the enclosure is small and installing regular 4 screws bulkhead connectors will prove to be a headache. On the inside I installed two L-shaped supports / rails (formed out of tin-plated brass sheet) to create a "bed" for the PCB and a good solderable ground connection for the SMAs. This board serves as an insulator and also acts as a spacer in order to raise the PCB from the bottom of the box and bring it closer to the bulkhead connectors. The two L-shaped tin-plated side rails go on the top of the fiberglass spacer board holding it into place. The RF-IV PCB goes on top of these rails. I used tin-plated brass screens to create the internal RF shielding. 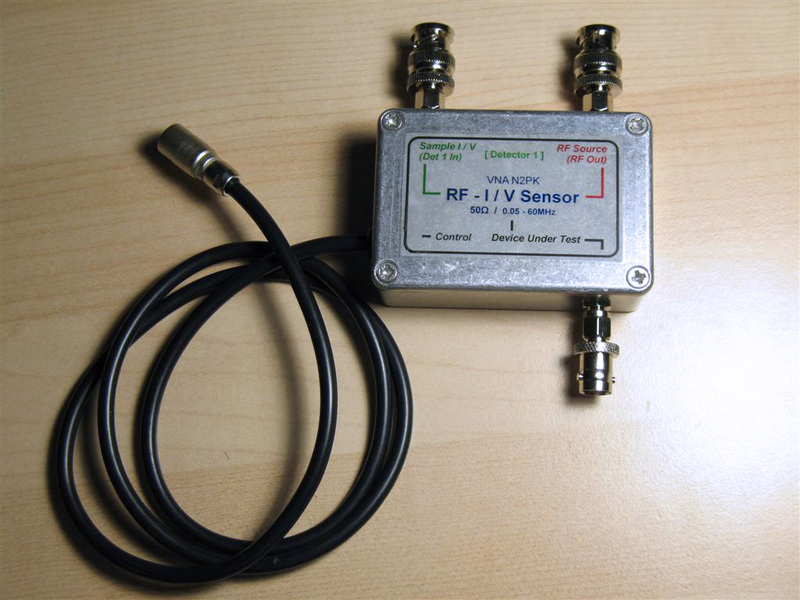 It is important that there is a good RF screening between the RF DDS and DUT ports. Each sampling transformer has its own screened compartment. The L-shaped rails on the two sides with the RF connectors were very convenient points for mounting the screens - I just soldered the RF shield elements to the sides. 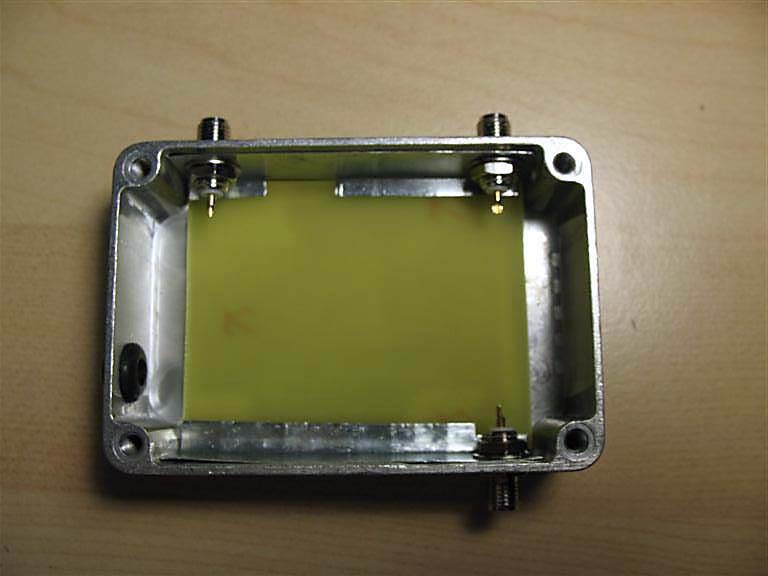 This picture shows that the internal screening is raised about 1-2 mm from the PCB, allowing enough clearance from the components and signal traces.